And Another Thing...: Heads Up Seattle Dance Fans! What a treat for Puget Sound dance lovers! 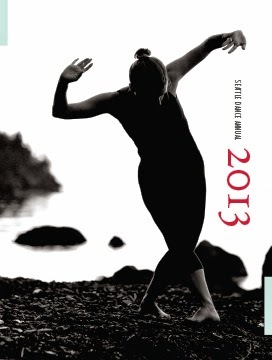 Seattle dance writer and designer Rosie Gaynor has assembled a wonderful compendium of 2013's dance highlights: favorite performers and performances of the year, a list of dance companies, and hundreds of photographs. The site goes live Sunday evening, May 18th: www.seattledanceannual.com. You'll be able to access this book in several ways: as an online PDF, a high-res downloadable file, even as a soft-cover book available on Amazon. All that information will be available on the Dance Annual site. Gaynor queried local dance writers (including yours truly) about our favorite moments from last year. Then she pulled those responses together into a beautifully designed book that includes scholarly essays as well as contact information for choreographers and dance organizations. She calls this labor of love part information, part celebration of the Puget Sound region's vibrant dance scene. If you don't find your faves, contact Gaynor at seattledanceannual@gmail.com. Another heads up: Whim W'him's May performances at Seattle's Erickson Theater Off Broadway continue this weekend and next. I'll have a review of the show, #unprotected, on Monday 5/19. Also on tap this weekend and next, Spectrum Dance Theater's festival of American music and dance: Rambunctious! Check 'em both out.